The movie is playing at Pointe Orlando and Oviedo Marketplace. Check listings for show times. 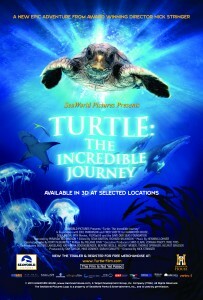 Turtle: The Incredible Journey, a family documentary directed by National Geographic Explorer’s Nick Stringer and distributed by SeaWorld Pictures, debuts Friday, June 24th in Orlando. Turtle: The Incredible Journey is an award-winning film that follows the life and migration of a loggerhead turtle from hatching to maturity and a return to its original Florida nesting grounds. The loggerhead turtle, a threatened species, has one of the longest and most difficult migratory patterns of any marine animal: Sea turtles newly hatched on the East Coast of the United States (usually in Florida) make their way from the sand into the ocean, and then begin a voyage that can span the entire Atlantic Ocean, only to return decades later to that same beach.